Both the People’s Republic of China (PRC) and Nordic countries (Sweden, Iceland, Denmark, Norway and Finland) view gender equality as a social justice issue and are politically committed towards achieving gender equality nationally and internationally. Since China has taken a proactive position on globalization and global governance, gender equality is possibly an area that China may wish to explore in collaboration with the Nordic countries. Violence against women, women’s employment, and women’s education, can and should be addressed by enhancing the legal and policy framework within a sovereign state. However, newly emerging gender equality issues that occur in the context of globalization are far more complex. Globalization is gendered in the sense that its effects in the labor market and family level vary by gender. Areas of concern are when jobs are transferred to areas where low-wage female workers are readily available have been identified. To address conventional and separately national as well as international gender equality issues. To identify and address newly emerging gendered effects of global interconnections. To utilize a multilevel and multidimensional analysis of gender equality in families, communities, nations, regions and also internationally in order to achieve a more comprehensive understanding of the gendered effects of all areas of globalization. To view gender equality within a human rights framework that includes political and civil rights, as well as economic, social and cultural rights. In 1995, as hosts of the 4th World Conference on Women the PRC emphasized the importance of gender equality by defining it as a ‘basic national policy’. Although China has made remarkable achievements in terms of economic development, it continues to face significant challenges when it comes to gender equality. According to the results of three surveys on the Status of Chinese Women conducted in 1990, 2000 and 2010, gender gaps have widened in these years, along with rural-urban disparities and regional disparities. Despite recent setbacks due to austerity policies, Nordic states stand out globally in terms of gender equality. Over the past 40 years, the Nordic countries have collaborated to address gender equality issues within the framework of the Nordic Council of Ministers. Gender equality is perceived as a key characteristic of the Nordic countries and as a precondition for both the well-being of individuals and the sustainability of welfare states. Indeed, there is a long tradition of the so-called ‘women-friendly’ societies in which states work closely together with women’s organizations and academics focused on gender studies with gender studies guiding both national and Nordic gender equality policies. Both China and the Nordic countries are committed to achieving gender equality nationally. Work on gender-based violence is an example of how a separate and parallel gender equality issue within the respective nation states has been addressed and has led to significant political achievements. In both contexts, women constitute the vast majority of victims of gender based violence. Chinese legislation on domestic violence came into effect in 2016. This legislation was the result of about 15 years of strong collaboration between government and non-governmental women’s organizations, gender studies scholars and policy-makers. Since the Nordic countries started work on gender based violence earlier than China they have shared their knowledge. For instance, the Swedish International Development Agency (Sida) and the Norwegian Centre for Human Rights supported the Chinese Anti-Domestic Violence NGO, an actor which played a prominent role in advocating for legislative reform. There is great potential for China and the Nordic countries to address gender inequalities internationally. Nordic countries are strongly involved in the work of the United Nations on gender equality. In relation to CSW61 on the theme of “Women’s economic empowerment in the changing world of work”, the Nordic prime ministers offered ‘Nordic solutions to global challenges’. China is rapidly expanding its global political and economic influence through various platforms, including its role on the UN Security Council, participation on the G20 and the G77+China, as well as two, bilateral and multilateral trade agreements all demonstrate China’s economic ambitions. Most recently, Xi Jinping’s 2017 World Economic Forum address was seen as a defense of globalization and a decree that China is prepared to lead cooperation on international issues. Given the Nordic countries experience and systematic approach to addressing gender equality issues internationally and China’s emerging role as a world leader, there is clear opportunity for cooperation. To aid in this effort, there are already well-defined international goals which could be focused on in the form of the Sustainable Development Goals (SDGs) adopted at the United Nations in 2015. SDG 5 seeks to ‘achieve gender equality and empower all women and girls’. Nordic collaboration with China on SDG 5 may be a strategic opportunity to leverage China’s commitment to a global process of improving the situation of women and girls and can help build China’s capacity as a newly evolving global donor and influential global player on important development issues. Aside from these possibilities, there are other collaborative opportunities that have arisen. 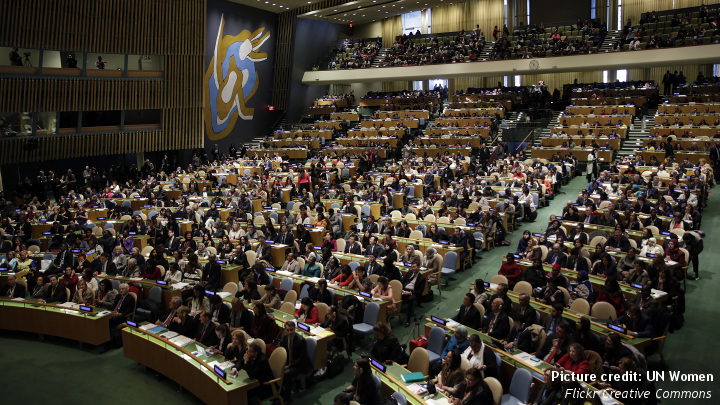 At CSW61, China reiterated that globalization should be made fully inclusive and equitable for all, including for women and girls. Globalization processes that are gendered tie China to other parts of the world through enormous and rapid global flows of people, goods and capital. They are also manifested in the huge variety of goods from the Chinese ‘factory of the world’, as well as a large amount of investment on infrastructure projects and green energies, and increasing bilateral and multilateral cooperation projects. In order to more fully understand newly emerging gender issues in interconnected global processes, and thereby be able to address them in terms of policies, joint Chinese-Nordic research projects are needed. University research based on gender as a theoretical, methodological and analytical lens is essential in order to understand how gender inequalities exist in globally interconnected social worlds. Incorporating gender as a central category of analysis and utilizing a multilevel analysis of gender equality in families, communities, nations, regions and also internationally can lead to a more comprehensive understanding of the gendered effects of globalization. At the same time, it can reveal tensions and similarities within the complex relationships between women and men of different and specific countries and classes. Describing and analyzing these tensions is a prerequisite to addressing gender equality issues that have arisen as bi-products of globalization. Addressing gender inequalities requires collaboration from both practitioners and policymakers, engagement of feminist movements and the insights of academic research. Collaborative effort is essential to identify issues, formulate policies and monitor their impact. In both China and the Nordic countries, there is a tradition of interaction between gender studies and policy makers. This bond means that the knowledge produced by gender studies experts transfers into practical policy. The individual Nordic states and the Nordic Council of Ministers financially and politically promote gender equality and women’s studies. In China, the Chinese Women’s Research Society (CWRS) has established a national network to facilitate collaboration between universities, social scientists, women’s federations and party schools. Aside from domestic violence legislation, there are several successful cases of collaboration among academics, activists and women’s federations in altering gender discriminatory practices such as the culture of ‘son-preference’. Additionally, dialogue between China and the Nordic countries may draw upon and build on experiences gained and collaboration developed over the past twenty-five years between Nordic development aid entities and gender studies scholars and Chinese gender equality practitioners, policy makers, NGOs and gender studies scholars. Moreover, conversations on what can be perceived as the relatively politically nonthreatening field of gender equality issues may very well serve as an entry point to an exchange on both culture specific and universal values and practices in other spheres of the globally interconnected societies of China and the Nordic countries. Policy-makers: Engage in policy conversations on promoting gender equality through good global governance. Academics: Facilitate joint Sino-Nordic academic research on gender equality and globalization with a focus on the role of emerging and globally interconnected economies. Cai Yiping is an Executive Committee member of Development Alternatives with Women for a New Era (DAWN). She is currently based in Beijing, China. Dr. Cecilia Milwertz is a Senior Researcher at the Nordic Institute of Asian Studies, University of Copenhagen and coordinator of the Sino-Nordic Gender Studies Network.